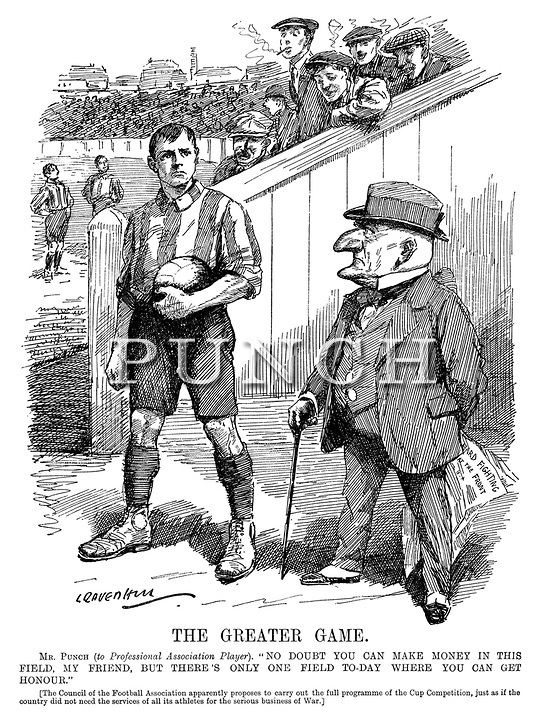 A Punch cartoon, later made into a poster, shows Mr. Punch saying to a professional football player, “No doubt you can make money on this field, my friend, but there’s only one field today where you can get honor”. On this morning British and French cavalry at Passchendaele, on a ridge midway between Ypres and Roulers, leave the village and fall back towards Ypres. They have not been attacked, but seek the greater security of proximity to the larger town. Both sides begin to dig trenches, linking them in a continuous line, with machine gun emplacements, dugouts, communication trenches leading to the rear and saps going forward as close as possible to the enemy front line. The trench lines established in the Ypres Salient become the scene over the next four years of the harshest fighting of any war in history. The Irish Guards are given the orders to “drive back the enemy wherever met”. The first Battle of Langemark begins. It will last for four days. In heavy fighting at Le Maisnil, the Argyll & Sutherland Highlanders and the Middlesex Regiment are forced to retire this evening leaving on the field eight officers and men who will be buried the following day by the enemy. Captain Edward Stephen Gibbons (Middlesex Regiment) displays great coolness and zeal in action at La Maisnil during what is described as a serious emergency. For his actions he will be awarded the DSO. He will be killed in September 1918. The operation to capture Edea has scarcely commenced when a whaler belonging to the Nigerian Government Yacht Ivy capsizes on a sandbar in the Njong River, drowning the superintendent of the Nigeria Marine, Commander George Smith Booth Gray (HMS Cumberland, Royal Naval Reserve), Lieutenant Herbert Alexander Child CMG (HMS Cumberland, Royal Navy) is also killed at age 44. He is the son of the Reverend Alfred Child also killed is a French staff officer and one of the nine native soldiers on board. The lifeboat of the steamship Fullah is immediately launched and succeeds in rescuing Captain Cyril T M Fuller and the remaining eight natives. Captain Fuller is pulled exhausted from the surf after struggling valiantly to save the others. Lieutenant Gladwyn Maurice Revell Turbutt (Oxford and Bucks Light Infantry) is killed at age 31. He is the son of William Gladwin Turbutt JP and great grandson of General Henry Gladwyn Defender of Fort Detroit Canada in the War of 1763 against the Indians. Major Nigel Lucius Samuel Lysons(Royal Lancaster Regiment) is killed in action at age 38. He is the son of the late Canon Samuel Lysons Vicar of Rowsley and served in the South African War. Major Charles Inglis Stockwell(Seaforth Highlanders) dies of wounds received 20 October at age 38. He is the son of General C M Stockwell CB and he served in the Nile Campaign of 1898. Captain ‘the Honorable’ Charles Henry Stanley Monck(Coldstream Guards) is killed in action at age 37. He is the son and heir of the 5th Viscount Monck. He had served previously in the South African War. He is the son-in-law of ‘Sir’ William Wyndham Portal 2nd Baronet and he is a member of the MCC. Captain S G Roe(Royal Inniskilling Fusiliers) is killed at age 39. His widow will marry Lord Gravers. Lieutenant Anthony Gerald Malpas Robertsof the same Regiment is killed at age 19. He was the “Victor Ludorum” three years in succession at Ardingly College, Sussex. Captain William Miles DSO (Welsh Fusiliers) is killed at age 38. He served in the South African War and is a member of the MCC, the I Zinjari and the Free Foresters. Captain Penry Bruce Lendon MVO (Lancaster Regiment) is killed at age 31. He is the grandson of the Reverend W P Lendon and son-in-law of the Reverend Canon Richardson Vicar of Northop Flints. Captain John Ralph Mylton Thornycroft (Royal West Surrey Regiment) is killed at age 30. His brother was killed last month. Captain Cameron O’Bryen Harford Methuen (Warwickshire Regiment) is killed at age 38. He is related to Field Marshall Methuen GCB and served in the South African War. Captain Allan Humphrey Harden (Oxford and Bucks Light Infantry) is killed when shot in the head at age 33. He is the grandson of Judge Harden of Cheshire and General Atkinson of the Madras Army. His wife is the granddaughter of John Howe JP DL and a cousin of the Right Honorable Lord Musketry. Captain William Miles Kington (Welsh Fusiliers) is killed at age 38. His brother will die on service at home in September 1943. Captain Arthur Howell Romilly (Duke of Cornwall’s Light Infantry) is killed at age 37. His brother will be killed next September and he is the son of Captain Francis J Romilly Royal Engineers who was killed in Soudan at Trofek. He is also a descendant of ‘Sir’ Samuel Somilly Solicitor General and law reformer of the early 19th He served in the South African War. Captain Daniel George Harold Auchinleck (Inniskilling Fusiliers) is killed at age 37. He is the only son of Major Thomas Auchinleck DL and played cricket for the Winchester XI in 1894 & 1895 against Eton. Captain Logan Deare Passy (Duke of Cornwall’s Light Infantry) is killed at age 33. His brother will be killed in August next year. Lieutenant Henry Stanley Lowe(Worcestershire Regiment) dies of wounds in Paris received over a month ago on the Aisne at age 24. He is a son of the late Reverend E J Lowe Vicar of Stallingborough. Lieutenant Christopher Fowler Murphy (Oxford and Bucks Light Infantry) is killed at age 25. He is the son of the Reverend Richard William Murphy Canon of Tuam. Lieutenant Theodore Prain(Leicestershire Regiment) is killed in action at age 26. He is the son of Lieutenant Colonel ‘Sir’ David Prain, CMG, CIE and Lady Prain. Second Lieutenant Theodore Hugh Galton (Worcestershire Regiment) is killed at age 26. His brother will be killed in April 1917 and they are grandsons of Major General ‘Sir’ Henry Hugh Clifford VC. Second Lieutenant Horace Holmes Watkins (South Wales Borderers) is killed at age 23. His brother will die of wounds next February. Second Lieutenant William Woodthorpe Barnard-Smith (Royal Field Artillery) is killed at age 21. He is the son of the Reverend Barnard Gooh Barnard-Smith Rector of North Cove. Second Lieutenant Leonard Amauri Filleul(Somerset Light Infantry attached Oxford and Bucks Light Infantry) is killed when he is shot in the chest at age 26. He is the Master at Monkton Combe School, Bath and had rowed in the winning Oxford trial eights in 1910. He is also the Secretary of the Lincoln College Boat Club and the son of the Reverend Philip William Girdlestone Filleul, Rector of Devizes Wiltsire. Second Lieutenant Reginald Fydell Walker (Manchester Regiment) dies of wounds received the previous day. He is the son the Reverend David Walker Vicar of Darlington and nephew of General J T Walker Royal Engineers the Surveyor General of India. Private Lionel Vernon Brown (West Surrey Regiment) is killed at age 25. His brother will die of wounds at home in July 1916. Private Joseph Dowing Lake (West Surrey Regiment) is killed at age 21. His brother James will also lose his life in the war. Private William Turner (Duke of Cornwall’s Light Infantry) is killed at age 21. His brother Walter John will be killed in the Great War. Private John Banks (West Surrey Regiment) is killed. His brother Richard will be killed in one week. Private John Charles Howell (Duke of Cornwall’s Light Infantry) is killed at age 21. His brother Arthur will also be killed in the war. Private Lewis Pelgrena Mazzei (South Wales Borderers) is killed at age 30. His brother will be killed in May 1917 and they are the only Mazzei to lose their lives in the service of King and Country in the Great War. The Plus 1 is Hungarian Gymnast Arpad Pedery who was a member of the Silver medal winning Men’s Team European System Gymnastics team at he 1912 Olympics. Lt Henry Stanley Lowe – above – died in the Hotel Claridge Hospital, Paris, run by the Women’s Hospital Corps which was led by Louisa Garrett Anderson & Flora Murray. His sister was with him. She went back later to work there as an orderly. Does anyone know her first name or any other details? Thanks for this! I think her name began with S – as she was nicknamed Slow at the WHC – but I will do some detective work and post my results.